Careful With That Axe, Eugene: UK Election - How did the pollsters do? 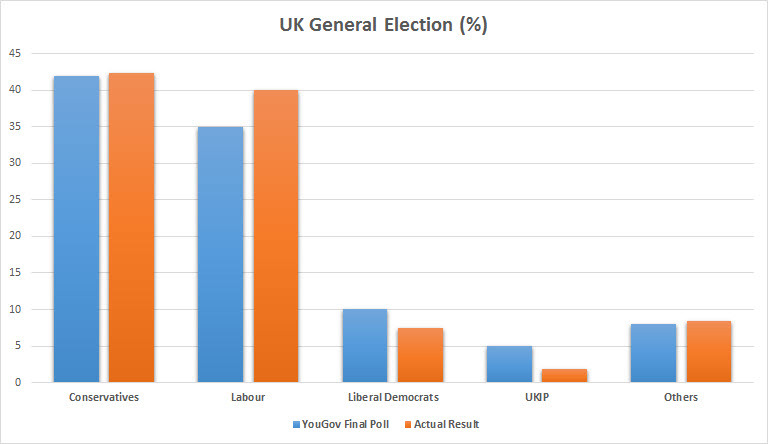 The poll was almost spot on for the Conservative and Others vote, but it underestimated the Labour vote by 5% (more than the +/- margin of error), and over estimated the Lib Dem and UKIP votes. So they got the overall result they predicted (an "increased Conservative majority") wrong, but not by much in my opinion. The science of sampling clearly has some work to be done, but I believe that the approach of YouGov to include factors (such as age, likelihood of voting) other than voting intention is a good approach - they can only get better.